Our baby hair brush set contains three grooming accessories, each suited for different stages of your little one’s hair growth. Perfect from birth, through the toddler years and beyond. Our Wooden Baby Hair Brush and Comb Set contains three high-quality grooming tools, including: one hard-bristle brush, great for brushing and detangling longer hair; one wooden comb for medium-length hair; and one soft-bristle brush, perfect for newborns and older babies. Prevent Cradle Cap by brushing your baby’s scalp with our soft-bristle brush. 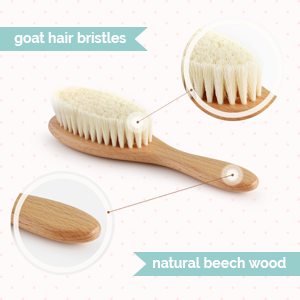 Our brush is gentle enough for daily use on baby’s delicate soft spot. A Perfect Baby Shower or Registry Gift! This baby hair brush set is ideal for your registry and makes an excellent gift for a friend’s baby. It is a very special gift that everyone will love. 100% Natural goat hair bristles prevent and reduce cradle cap by redistributing the hair’s natural oils through the strands and removing flakes from the scalp. 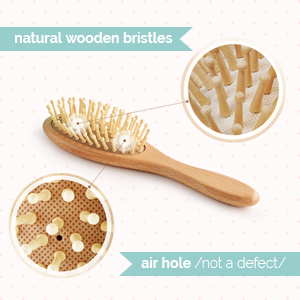 Our baby hair brush is much softer and gentler on your baby’s scalp compared to other synthetic bristle brushes. Our wooden bristle brush is designed to promote hair growth by providing better blood flow to the hair follicles and scalp. The solid wood handle is made from high-quality, durable materials, while the hole in the cushion of the paddle is intended for proper air circulation. The comb and brushes from our natural baby hair brush set are proven to be safe and effective, to give your baby a relaxing hair care experience and a good night’s sleep. If your baby has fine and delicate hair that tangles easily, never fear. 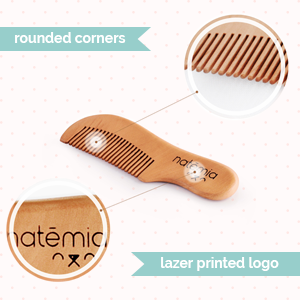 Our comb is crafted from 100% natural wood, which is static-free and reduces frizz. The rounded teeth of the comb are perfect for use on your little one’s sensitive scalp.